Caribou are superbly adapted to the Arctic where they are the most common large grazing animal. As such they sustain the economy and culture of northern people from Alaska, to Greenland, to Russia, to Norway. 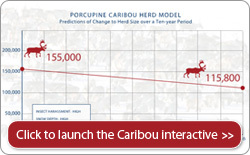 Recently, however, polar communities—and scientists—have seen changes in the caribou’s health and numbers. They have also noted warmer weather. They suspect a connection. They are the same species, Rangifer tarandus, but called caribou in North America and reindeer in Eurasia. Caribou are hunted in the wild. Reindeer are often domesticated and herded. To help predict the future, scientists have built a computer model. Check out a simplified version of this model here. 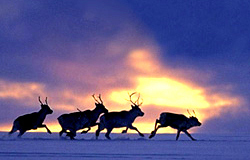 Caribou migrate seasonally between tundra in the north and open forests near the tree line in the south.